This is a report by Ian Bridge, a fellow member of the UK Jawa CZ Owners Club, about his 490 miles in 24 hours on a modified Jawa Jazz model 225 moped, in the 1993 ACU rally. Many thanks to Ian for his help in providing this and other material for the site. (a) There are some 55 checkpoints scattered around the country, and within a set mileage, you have to try and plot a route which enables you to visit as many as possible. (b) Certain of the checkpoints are only open until 10 pm. (c) You can have up to a maximum of 20 hours to complete the event. (d) There are statutory rest periods. Special Gold [500 accredited miles plus maximum possible number of checkpoints]. There are other rules as well but I won't go into them now. Having already done the event six times on my 350cc Jawas, this year I decided to try and make it more of a challenge for myself, and also possibly get a bit more publicity for the Club and the Marque. As most machines that take part are large capacity ones, I thought that a good stunt would be to do it on the smallest capacity machine. So at the International Motorcycle Show at Birmingham last November, I approached Jawa/CZ General Manager in this country Josif Chytil with the proposition of borrowing one of their Jawa Mopeds. Joe agreed, and so when the entry forms were sent out early in March my entry quickly went back as doing the event on a Jawa Moped. 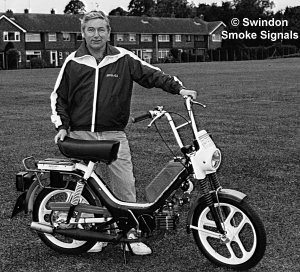 Following further correspondence, the Jawa Jazz moped was eventually delivered to Mike Coomes's Crowmarsh Classic Bikes workshop. My wife took me to Mike's, and after picking it up I rode it home. 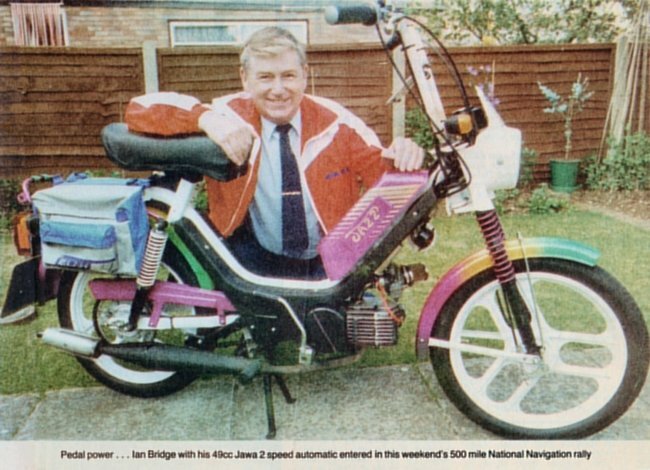 The moped was a Jawa Jazz 2 speed automatic - brand new (with only 115 Km on the clock), but the good people at Kings Lynn had carried out certain "go faster" modifications. I'm not sure exactly what they were, but the machine was fitted with a larger, forward facing carb', higher gearing, expansion chamber exhaust system etc, and while not fast by motorcycle standards, was easily capable of going at 45 mph. During the following week I rode the moped whenever I could, and although it went well, the spark plugs showed that it was running on the rich side. I contacted Kings Lynn, but it did seem that there was nothing I could do with respect to altering the carb' settings. Having chosen a route, made up some route cards and made a small route card holder to fit on the handlebars, with a pair of borrowed cycle panniers to carry a few spares and food/drinks I was ready for the off. Saturday July 3rd was a warm day with a good forecast for the whole of the event - I breathed a sigh of relief at this, as last years event was run in atrocious weather conditions, with no Swindon checkpoint this year, the nearest ones were either at Abingdon or Andoversford near Cheltenham. I chose Andoversford, so with a 30 mile run to just get to the start point, I left at 12.15pm so as to arrive in plenty of time for the 2pm start. The ride to the start was uneventful, with the moped running well, however at Fossebridge on the A429 to Northleach there is a 14% steep hill. The moped got half way up it, but with my weight on it, there was insufficient power to actually get right to the top. I did in fact have to get off, and for a short period walk by the side of it. At Andoversford I met John Kennedy who had arrived just before me on his 1957 Lambretta 150cc scooter, we both fuelled up, had a drink and talked to other entrants who were interested in what we were doing the event on. The 2pm start saw a lot of riders leaving the checkpoint, and both John and myself headed into Cheltenham on route to the first checkpoint at Tewksebury. I actually arrived at the first checkpoint before John, but on leaving, the moped started to cough and splutter and was reluctant to rev. John was off and away on his scooter, while I slowly managed to build up speed. As soon as the moped got to about 25mph it seemed to clear and started to run again all right. Up through Worcester and onto Kidderminster the moped ran reasonably all right, although while at the Worcester checkpoint I decided to change the spark plug. Once again the one I took out was very black indicating rich running. The ride to Wem was accompanied by occasional miss-firing, but this I traced to the plug cap not sitting properly on the plug. with it on properly it again seemed to improve. The 25 mile run from Wem to Stoke-on-Trent was in fact the worst of the whole event, with me thinking that I might even have had to give up the event. From Wem to Market Drayton the bike was finding it difficult to get above 10 mph due to the fact that it didn't want to rev, and sounded very sick indeed. From Market Drayton to Stoke the engine seemed to lack all power, and would not even pull up even the slightest of slopes. What should have taken me about an hour, actually ended up taking me nearly two. This loss of time was to put me behind the silver schedule I was working to, and I was never to make the time up. Feeling very frustrated now, at the Stoke checkpoint I stripped the carb' down, changed the spark plug again, and generally fiddled with the carb' settings trying to improve the running. I also noticed that the K & N type air filter used, was oil saturated and also clogged with hundreds of small insects. I cleaned this with the garage air line at the checkpoint, but also decided to run without the filter to see if that also made an improvement. well! the improvement was so dramatic that the little moped was now flying, and a steady 40mph was achieved easily. The road from Stoke to Ashbourne. was a very enjoyable ride, although there was a 16% hill at one point which again meant I had a short walk by the side of the bike. However at Ashbourne as I was heading towards the Darley Moor Checkpoint, I saw John Kennedy coming the other way. we both stopped, has a quick chat, and were soon both on our ways again. My journey then took me up through Matlock, Chesterfield, Ollerton, Nottingham, Leicester, Melton Mobray, Bourne etc. Much of this part of the course was covered during the night session, and with the headlight on the moped not being very good, even though the bike was now running perfectly, I could not keep up a speed which would have enabled me to make up time. At about 5am on the Sunday morning while at Bourne, I made the decision that the chances of getting a silver were now touch and go, and as I was feeling tired, I decided to miss out 3 checkpoints and head for the Peterborough finish. I eventually arrived at Peterborough at 6.30am having covered 352 miles , but actually only being accredited with 315 and 14 checkpoints (Must have been the number of times I got lost!!). There were already about two dozen riders there, many stretched out on the grass having a nap, but of those awake there was immense interest that I had undertaken the event on such a small machine. Checking out time was officially from 7.30am although they did in fact actually open up at about 7.15am, I collected my award, then went to the cafeteria for a full cooked breakfast. I stayed at Peterborough till 8.40am, seeing Roland and Gordon Webb both arriving, together with Colin Gregory who arrived just as I was leaving. A photographer from Motor Cycle News took my picture with the moped, although whether they used it I don't know. The 115 mile trip home, including a stop for coffee and toast at a Little Chef took me 4 hours, which all considering was really quite respectable for a moped. The Evening Advertiser; also carried pictures of me and the moped on two occasions (one actually in colour), and from the response I've had from work colleagues and family, all seemed suitable impressed. After all, at the end of the day it's all been good publicity. From leaving home to arriving back home, I actually covered 490 miles in just over 24 hours, really quite respectable for such a small bike. I would like to especially thank Joe Chytil of Jawa for letting me borrow the bike; Barry Goodison from Jawa for arranging for the bike to be prepared and delivered to Mike Coombes, the fitters who prepared it and Mike Coombes for agreeing that the bike could be delivered and collected from his workshop. A good event with superb weather - roll on next year, when I believe the format is to change slightly.